Curbside Splendor Publishing, 9781945883156, 300pp. From the unforgiving surf of Costa Rica to hidden vineyards in the South of France, the stories in Perfect Conditions span the globe, and the characters often struggle to find control in unrelenting circumstances: a deep sea fisherman discovers he may not be allowed to return home when his contract expires; a young woman mourns the death of a dear friend she cannot save; a newlywed couple embark on a disastrous honeymoon. Unflinching stories from an award-winning writer. 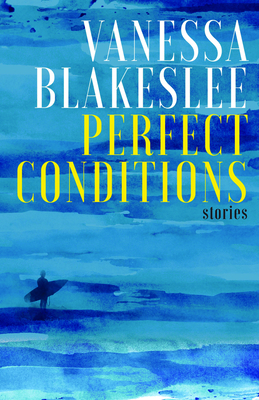 Vanessa Blakeslee's writing has appeared in The Southern Review, Green Mountains Review, The Paris Review Daily, The Globe and Mail, Kenyon Review Online, among many others. Her novel Juventud won the 2015 Bronze Medal, was a finalist for Foreword Review's Book of the Year, and a runner-up for the Eric Hoffer Award. Her short story collection Train Shots won the 2014 IPPY Gold Medal in Short Fiction.